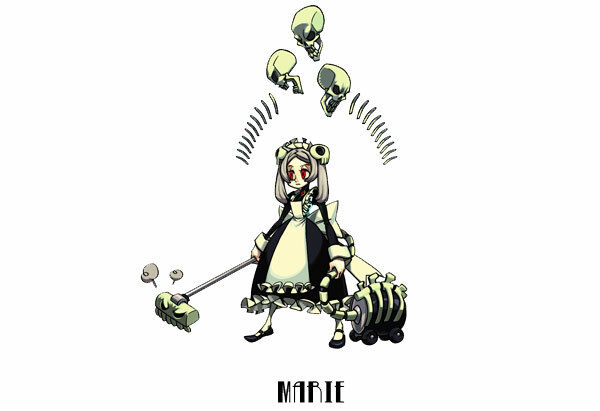 STORY: Set in the fictional Canopy Kingdom, Skullgirls pits players against ranks of deadly but beautiful opponents in an attempt to control the enigmatic Skull Heart, a mysterious artifact with the power to bestow wishes - but not without a substantial price. Should the soul be less than pure, both the victor's wish and her being shall be corrupted into a living nightmare that haunts humanity. 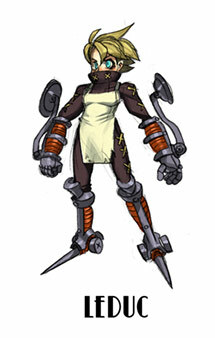 She will be known as the Skullgirl, a monstrous entity of immense power. 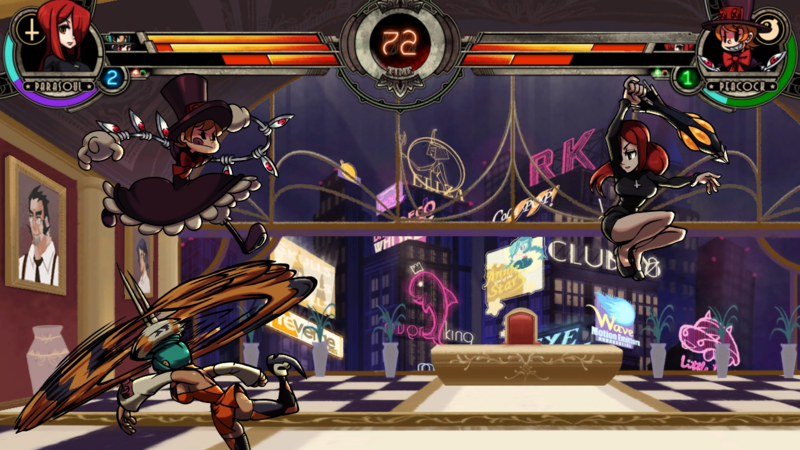 Skullgirls manages to bring the "weird & different" to the fighting game realm. REVIEW: It must be an intimidating and challenging ordeal for an indie company to set out to compete with the "big dogs" of the fighting game genre, especially these days. 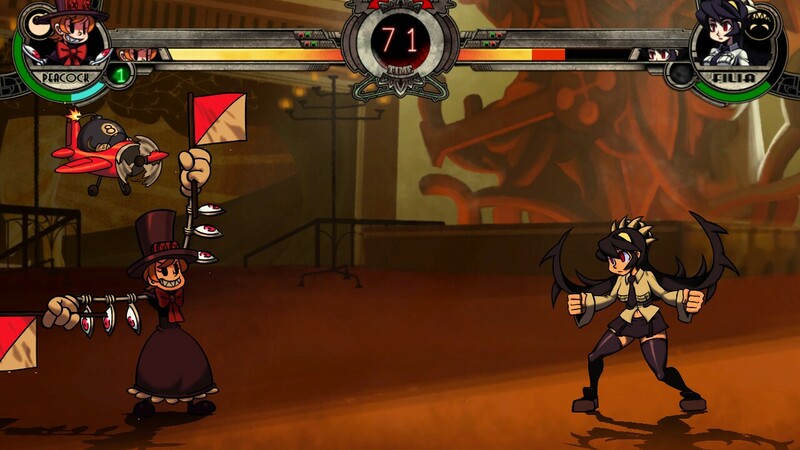 Created by the young company, Reverge Labs (founded in 2010 by industry veterans Richard Wyckoff & Emil Dotchevski), Skullgirls is a 2D fighting game with a roster of bizarre female fighters in an original, dark, deco world. 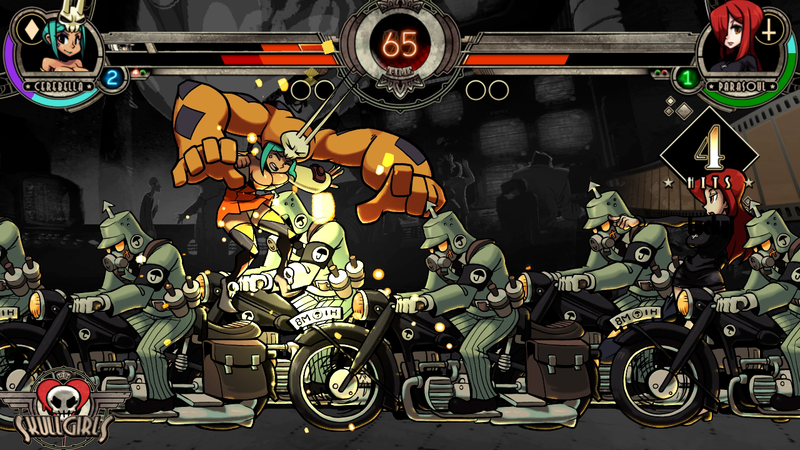 Featuring artwork by Alex Ahad of Scott Pilgrim & Lava Punch fame, and a gameplay system designed by renowned combo-expert Mike "Mike Z" Zaimont, Skullgirls certainly has its foot in the door. 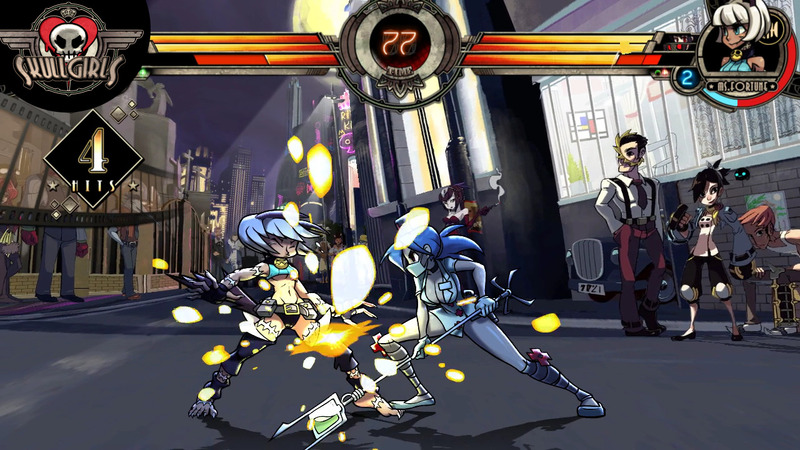 With balance at the forefront of their game design, the dev-team set out to create a competitive 2D fighter that would appeal to old school fighting game fans and players looking for something "different" from the fighting genre. 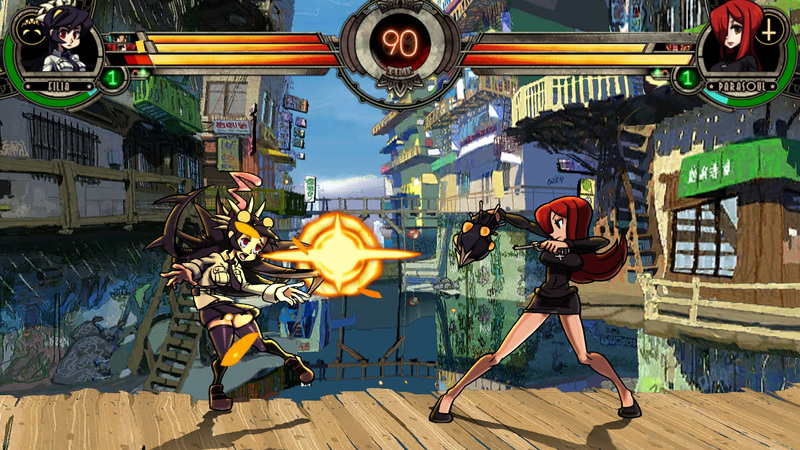 First let's talk about the art style, because the visuals are clearly what define Skullgirls from the start. Alex Ahad's trademark artwork seamlessly transitions to the game itself... the art style literally becoming the game. 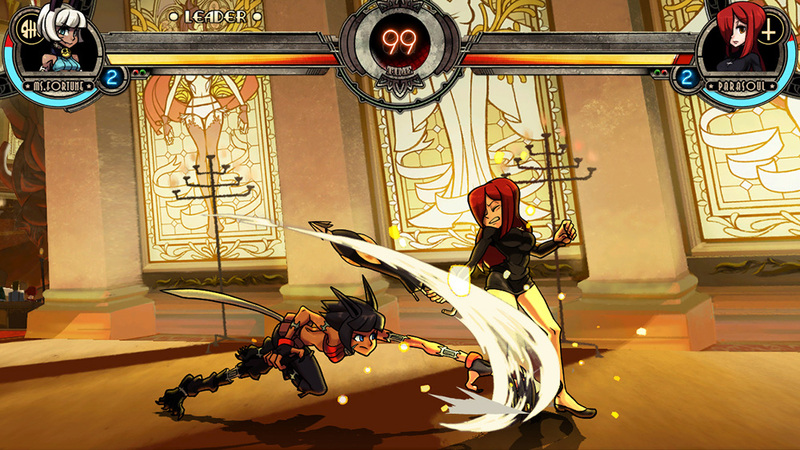 Ahad's vision of the Skullgirls world is portrayed beautifully on each stage, each of which hosting colorful, artistic backdrops and intriguing background characters. 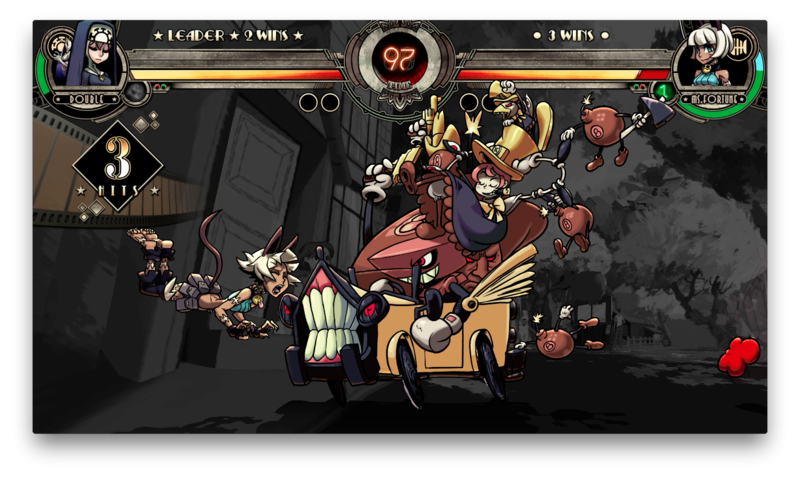 The "Skullgirls" themselves fill the screen as impressively sharp, large 2D sprites that are packed with personality and hilarious animations. Some of their wacky and clever attack animations will no doubt make you chuckle. There are only 8 playable characters from the start, but they are as different as can be. The girls also manage to feel like "complete" characters, each with a full range of priority attacks, special moves & a few super moves. 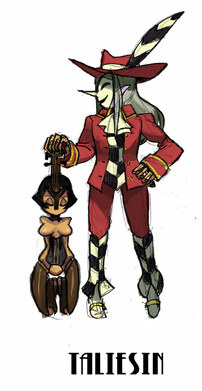 Expect the unexpected in Skullgirls... unless you're expecting girls. One thing I immediately noticed about Skullgirls is how many gameplay nuances are borrowed from one of the most fan-loved 2D fighters of all time, Marvel VS Capcom 2. I remember watching many "Mike Z MVC2 combo vids" back in the day (early 2000's)... Mike obviously spent a lot of time with MVC2, and has incorporated many of MVC2's iconic gameplay elements into Skullgirls. 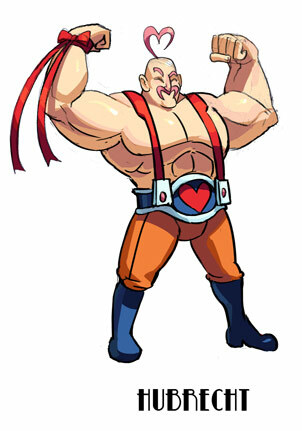 To name a few: Tag-in Attacks, Assist Attacks, Super Cancels, Push Blocks, Snapbacks, and a 5-tier super meter. Additionally, many character attacks (and even play styles) resemble some notable ones from MVC2... for example, if you were a Cable player, you might like using Peacock. 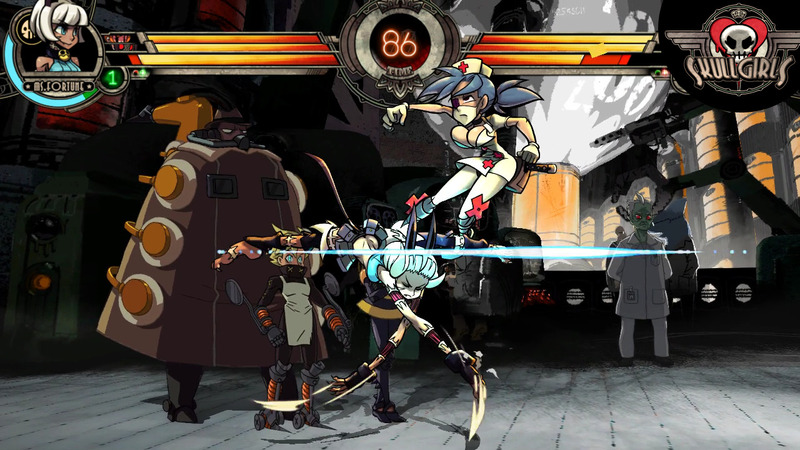 However, the Skullgirls definitely have plenty of unique attributes and considerably unique play styles. 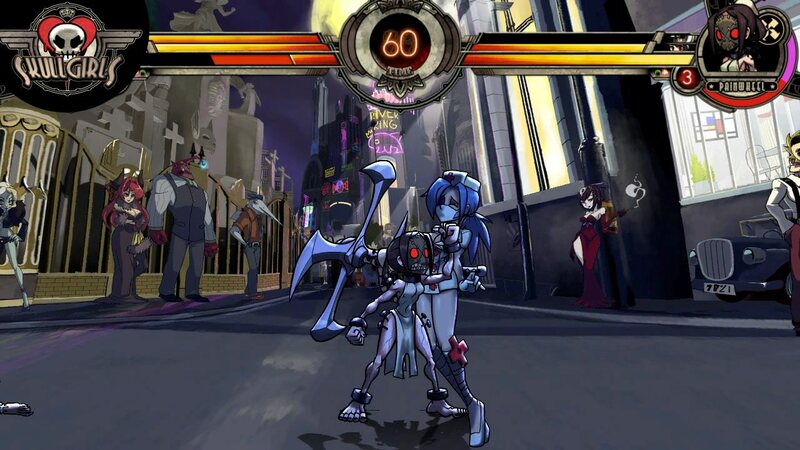 Skullgirls also features a Ratio System (inspired by another fan favorite, Capcom VS SNK 2). 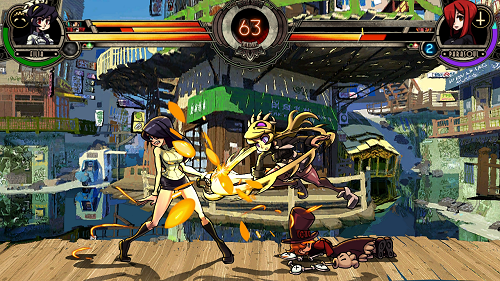 Before each match, players choose to use either one, two, or three characters per match. 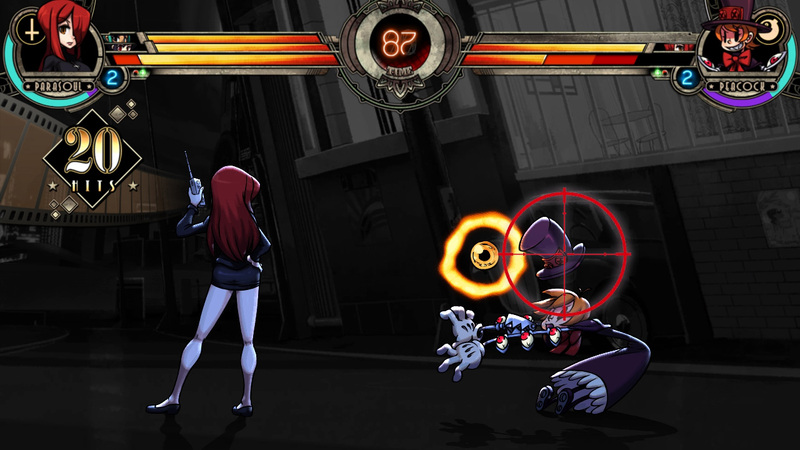 Single characters dish out more damage and have more HP, but lose the strategic advantages of character assists and the ability to regenerate health while off screen. Teams with two or more characters have less HP and do less damage, but are able to take advantage of assists and different play styles. The variety that the Ratio System brings to the table makes things fun and interesting (especially since there are only 8 characters). 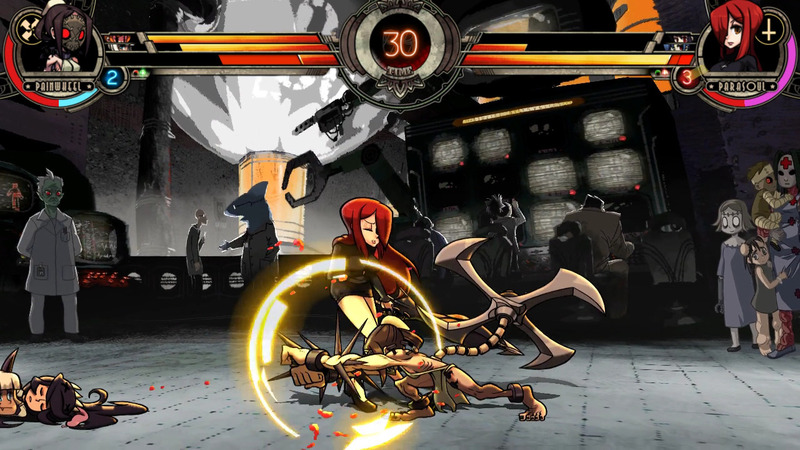 One of the headlining features of Skullgirls' gameplay engine is the "infinite detection system," which was created to help maintain character balance. If the game detects that a player is performing a loop or infinite combo, the hit sparks will change color and the opposing player can end the loop with a single button press. 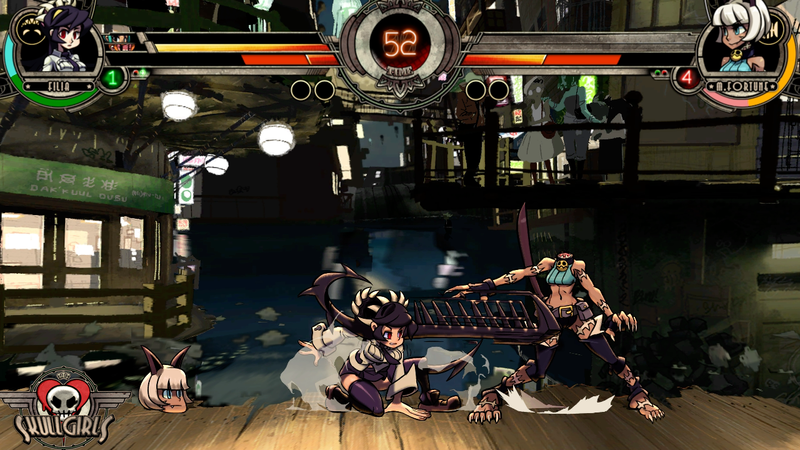 However, as long as the player is not performing a loop in their combo, they can continue their combo. 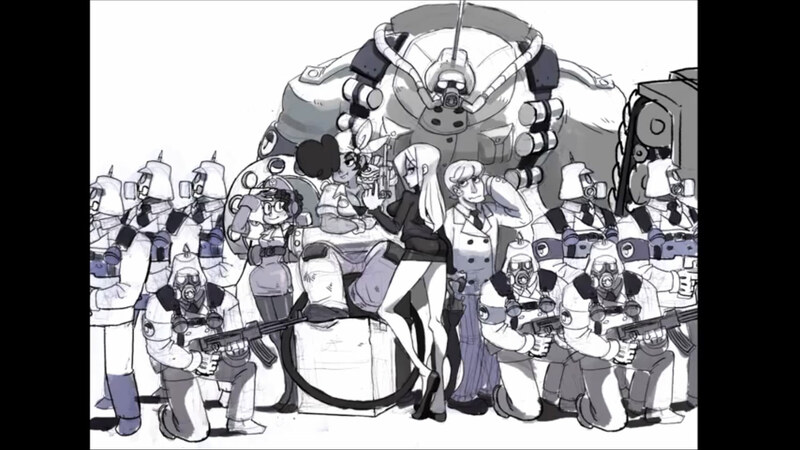 It's a pretty innovative idea, and I wonder if the current leaders of the 2D fighting genre are going to take notes. Like MVC2, assist attacks can be used creatively in a variety of ways, and of course allow for some pretty sick combos. 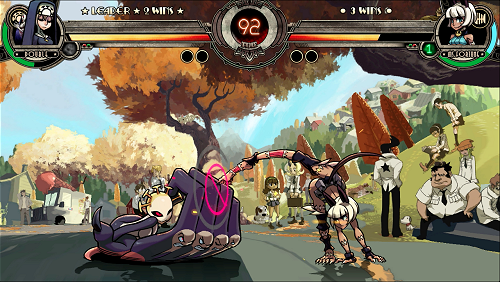 Skullgirls' innovative "unique assist" system allows players to choose any one of a character's attacks to use as an assist during gameplay (by inputting the command on the selection screen). 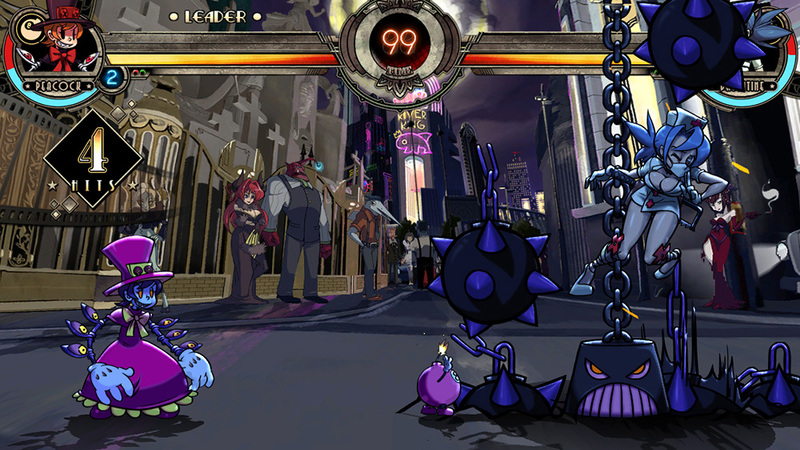 Players can choose any attack type, with the exception of super moves. These include: throws, normal attacks, dashes, and any special move. Each character also has a few preset assist attacks to choose from. In need of a pure 2D fighter in this era of fighting games? Download now! 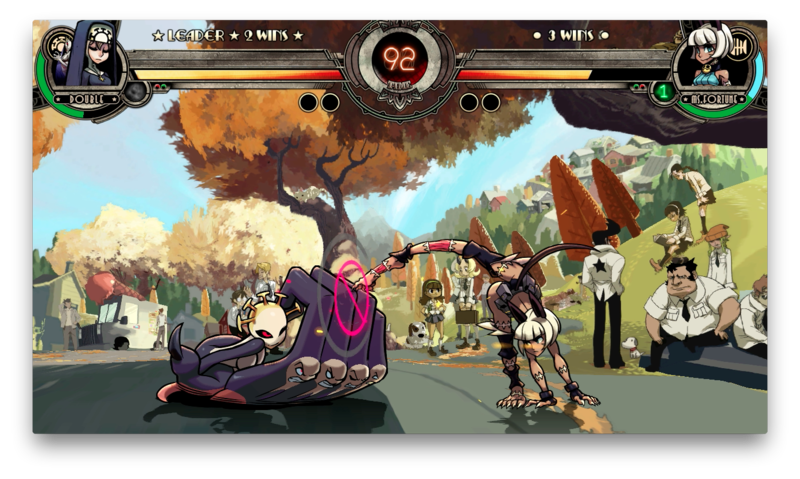 Visually, Skullgirls manages to stand out in this era of fighting games (which is always a good thing). The art style pretty much makes up 95% of the overall "graphics"... and while it looks impressive (especially in 1080p), the game doesn't offer much else when it comes to eye candy. I think the visuals would greatly benefit from some more graphical flare & effects. The hit sparks could be more exciting, and there's no special effect at all for finishing the round with a super move... making a stylish victory very anti-climactic. When normal attacks connect, the impact is generally dull as well. On that note, that "ouch factor" that many of us appreciate in fighting games really isn't there very often. This could partly be attributed to the characters' sprites & animations looking a bit flat. You might think I'm weird for calling 2D sprites "flat," but games like KOF XIII & 3rd Strike have proven that 2D sprites don't necessarily have to appear so "2D". In fairness, the character sprites are shaded very nicely, pack a lot of cool details, and suit the art style. 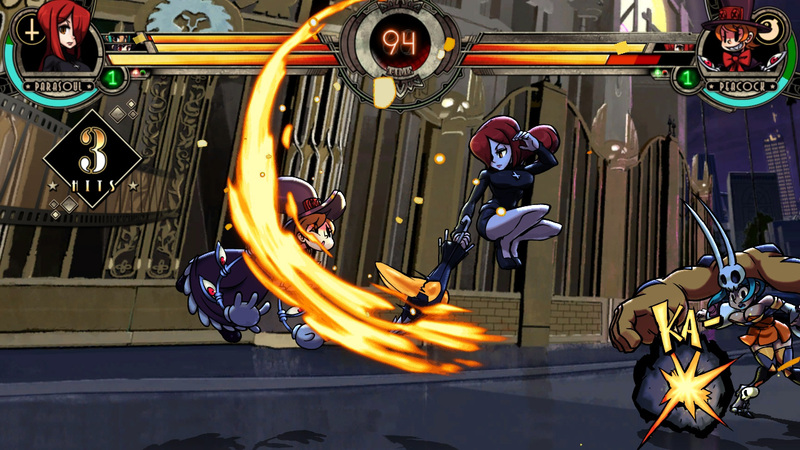 The jazzy/relaxing music of Skullgirls is a nice change of pace than what we're used to in the fighting game realm. A lot of BGMs are pretty catchy and also compliment the environments. The impact sound effects, on the other hand, aren't as much to my liking. You might think I'm nitpicking, but I've always considered sound effects in fighting games to be important... they help to define the game and enhance the action greatly. 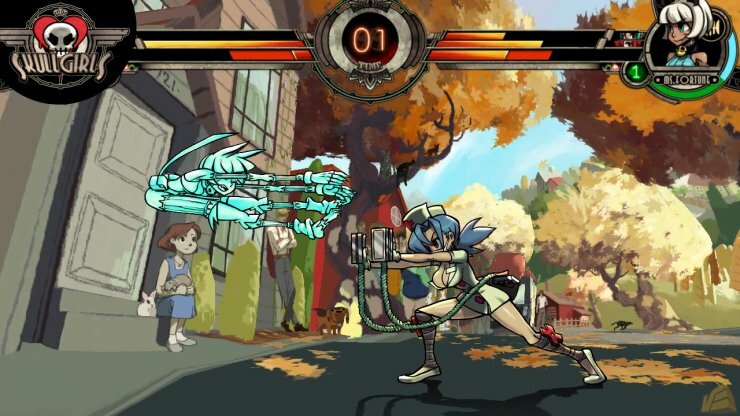 Thankfully, Skullgirls does have a few unique sounds (like the KO sound) that help to define it. Lastly, the voice acting isn't bad... but something about a lot of the voiceovers is "sleepy". I dunno... it seems like the voice actors were a bit tired, or uninspired. Oddly enough, it actually kind of suits the whole mood of the game. 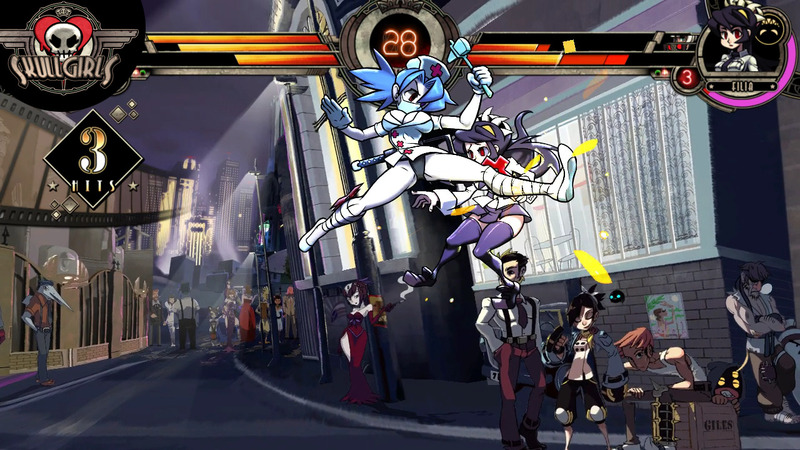 As a pretty cool fan service, Skullgirls contains quite a few interesting tidbits & features that "old school" fighting game players will appreciate. For starters, accidental pauses will never happen in Skullgirls, since you actually have to hold the button down... nice touch Mike Z! There's also a few cool taunts & quotes that are throwbacks to classic games & characters, but I won't mention any to avoid spoiling it for anyone. Characters also have unique spoken dialogue directed at each other from time to time, which is always nice to see in a fighting game. 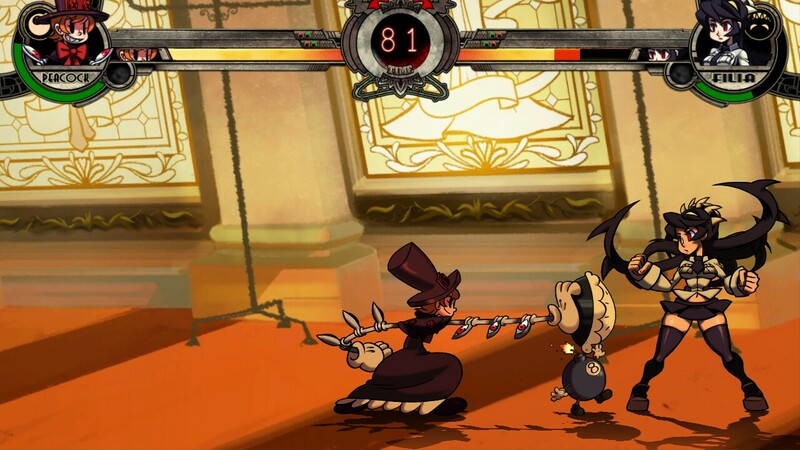 Finally, Skullgirls features a Story Mode which is comparable to Blazblue's, except that each character's story is short & sweet. There's a respectable amount of story artwork per character, and many interesting support characters as well. However, I find it a bit odd and irritating that the artwork & text boxes "disappear" after each segment of dialogue. Also, the story is 100% text based (with no voiceovers), so it doesn't quite live up to Blazblue's presentation in that aspect. The Tutorial and Training Modes are also appreciated, and definitely help new players get acquainted to the system. The Training Mode has some solid features, like: the ability to restart in either corner, dummy recording, reversal/guard/tech options, input display, and even hit box display. However (and a very big however), there are no character movelists in the game.... That might be a first for a console fighting game. Ohh well, thank goodness for the internet! Speaking of online, Skullgirls uses GGPO netcode and offers some pretty smooth online gameplay too! 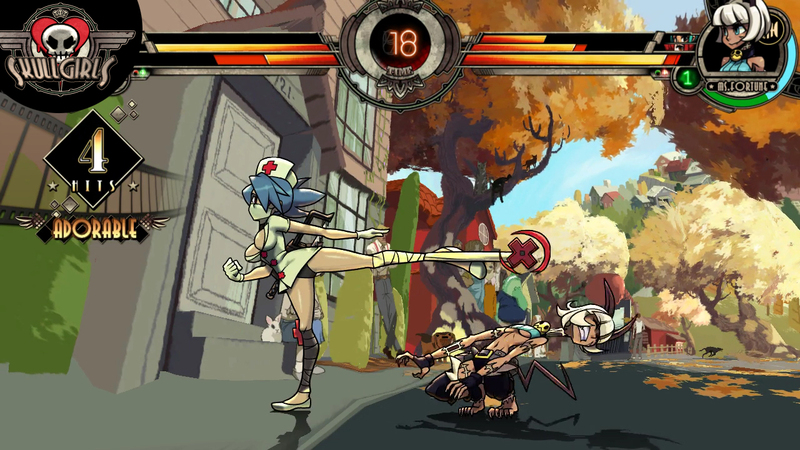 Final Words: As an "indie" fighting game, Skullgirls clearly has a lot of heart, which doesn't go unnoticed. 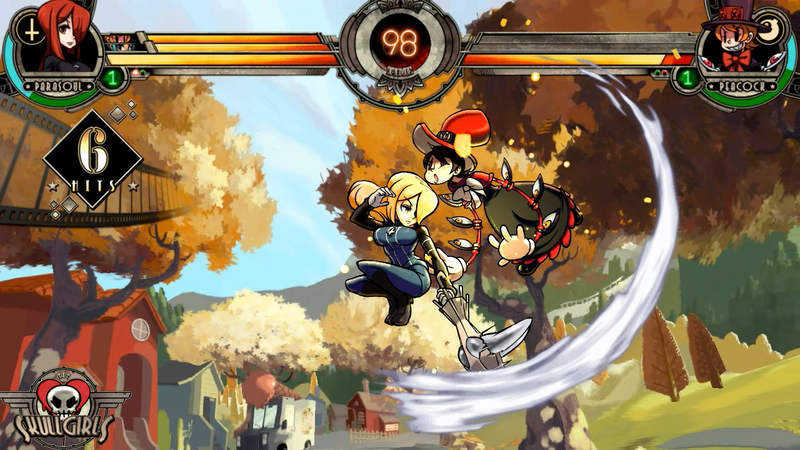 Skullgirls has a "cute" appearance... but it definitely has a grown-up gameplay engine. In the end, I think the game really lives and dies by the spunky art direction. If the art style doesn't really float your boat, hopefully the innovative approach to gameplay design will win you over. 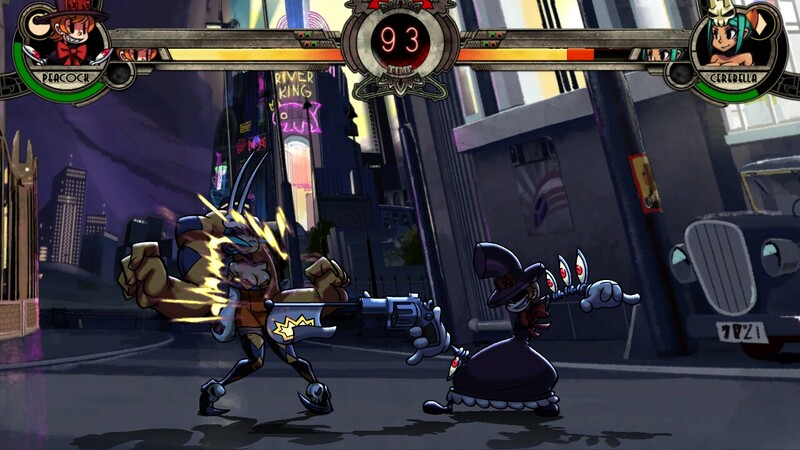 In any case, Skullgirls is definitely worth trying out... especially for a very reasonable $14.99. 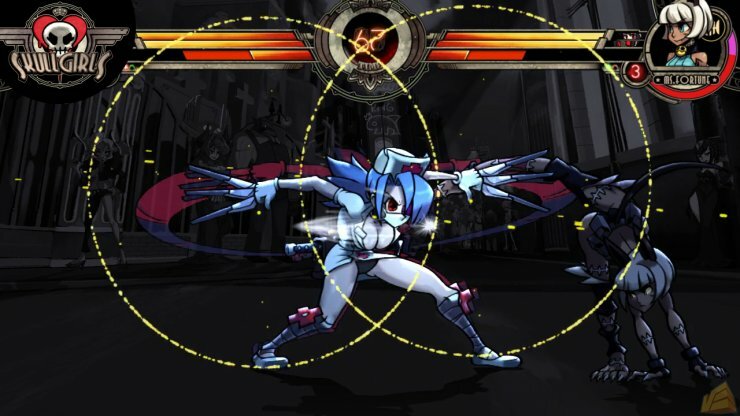 I respect Skullgirls for being different and innovative in some areas, but I have to be honest and pull the "it's not my kind of fighting game" card. 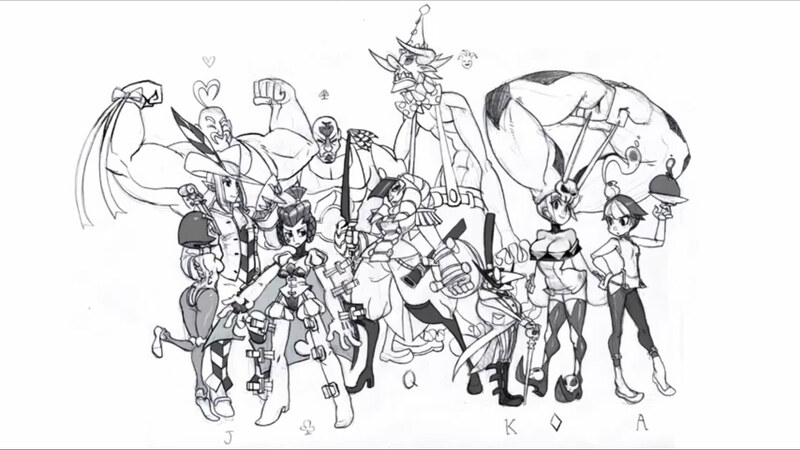 I never was a fan of "all girl" fighting games, or those made up of primarily "oddball" character designs... and Skullgirls doesn't change my mind. 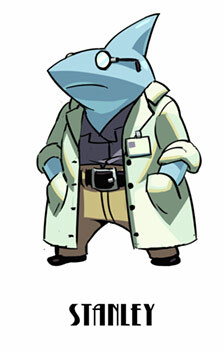 The character designs do have a coolness about them, but I'm just not fan of the designs or art style in general. 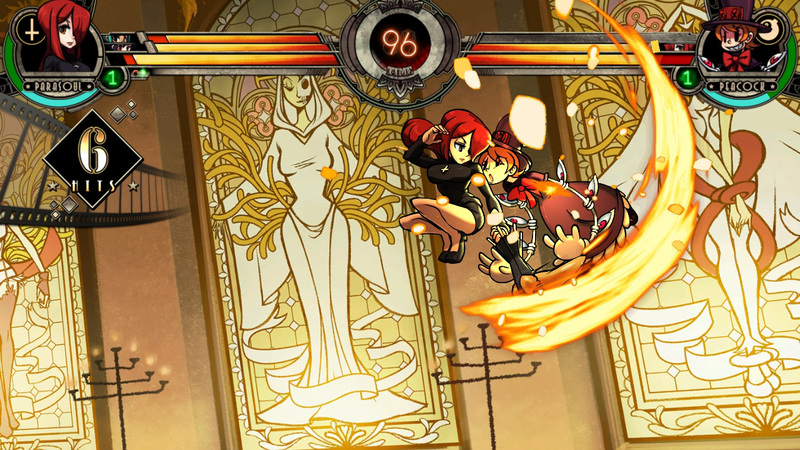 The ladies of Skullgirls do get an "A" for originality at least... 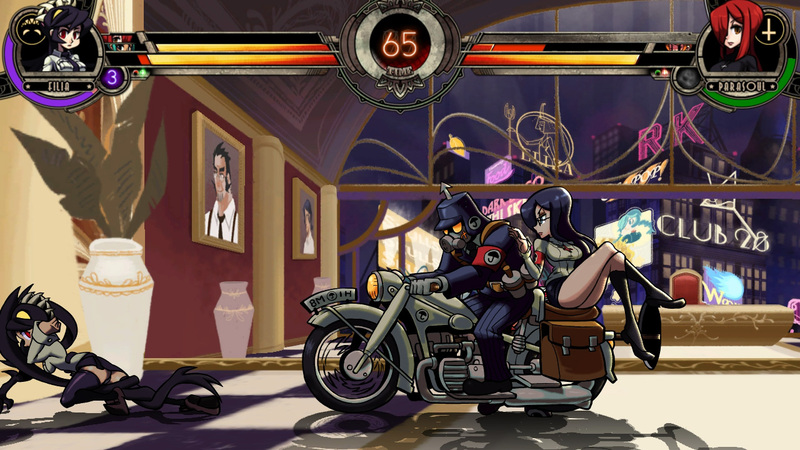 I mean... Skullgirls is just weird. 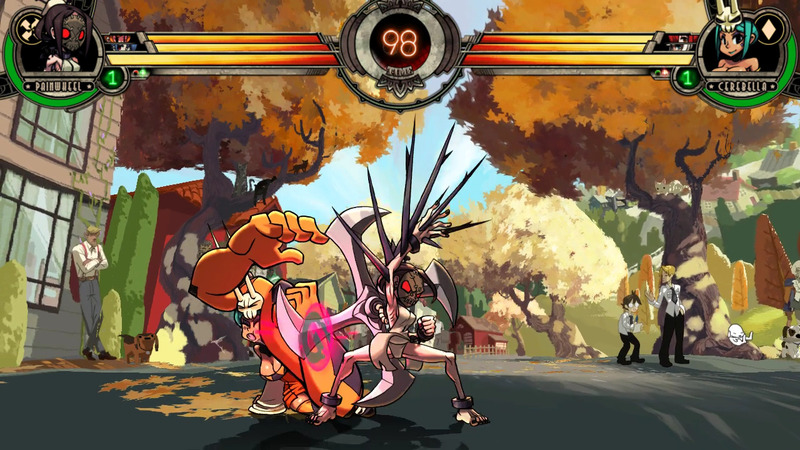 There's really not a straight forward character in sight, but if you like "weird & different," there's a good chance you'll like Skullgirls. 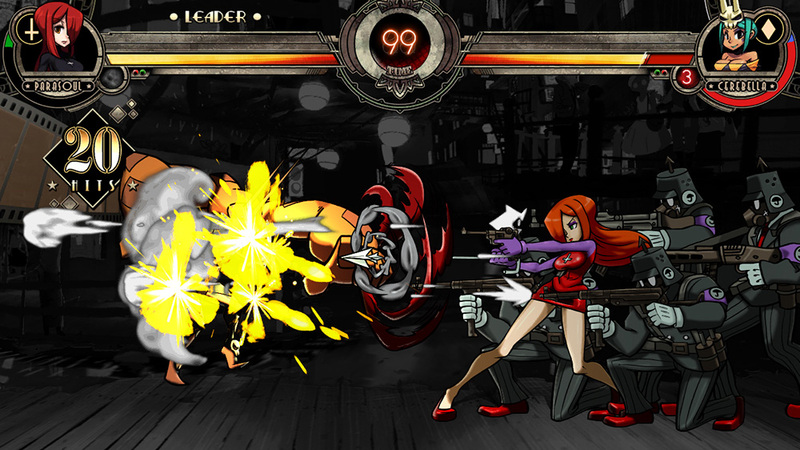 The gameplay engine is something like a cross between Street Fighter, Blazblue and MVC2. While the gameplay mechanics are very much respectable and feature a pretty fun air combo system, the game is actually kinda slow for my tastes. To be honest, I stopped playing the game after about a week (as I expected). Nonetheless, I'm still interesting to see how the sequels turn out. Click Here for more Concept Art!